Not to many smokers these days which is a good thing, but if you have smokers this little ashtray is the best. Push down on the steam ashes drop inside and won’t leave ashes all over. Drop lite cigarette inside and it smoothers out. Definitely great for windy days. But of coarse use common sense when smoking outside 😉. Would definitely recommend. 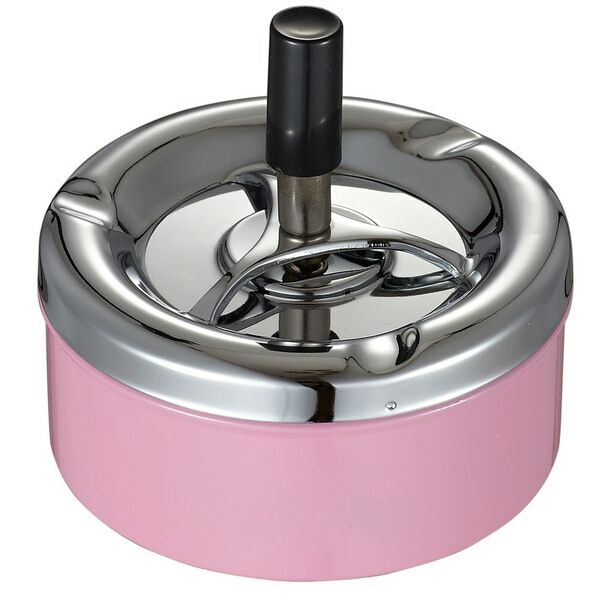 Comes with a mirror and metallic pink finish and a spinning mechanism with triple cigarette rests. It works great and is like a very cool gadget that does not look like an ugly ashtray. People ask me what it is. The decorative look is pretty and dainty. I bought two and one broke after the first day, so I'm not holding out much hope for this one. It could surprise me, though. If it holds out, I'll come back and edit my review.